Last week I seemed to spend most of my time at the V and A museum (not a bad thing at all!) One of the study sessions I went to was about the legend that was Dior. It difficult to know what to say about Dior, partly because a lot of it has been said before. So I will just share a few of my favorite Dior snippets of information. 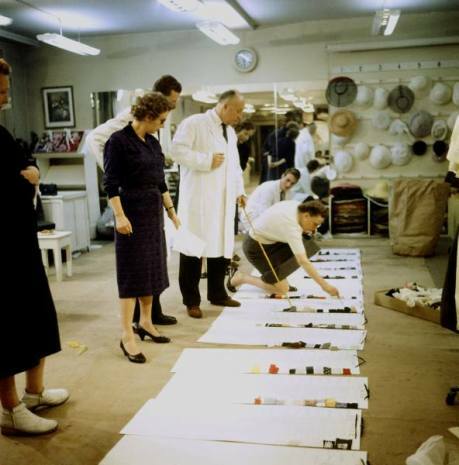 Popular to contrary belief Dior was no expert tailor. He was a skilled designer who understood the female form perhaps better than any other man of the 20th century yet; he relied on his assistants to turn his fairytale ideas on paper into real life creations. His assistant Mme Carre was head of workrooms and responsible for bringing his ideas from paper to fabric. 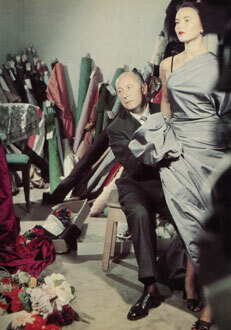 It is interesting therefore to note that this picture, one of the most famous of Dior is almost certainly staged. Unlike his contemporary Jacques Fath (swoon) who liked to work by draping the fabric on his model Dior was a designer who liked to work from sketches. 2) Dior and his “golden stick”. Dior was well known for his gold tipped cane he carried around with him. This cane was used to prod his models (sometimes in appreciation, sometimes in disapproval) and to select the fabrics and designs he liked best. 3) Dior had three mothers. This makes me think of him like a chemist (or even an alchemist!) mixing together his potion of designs to create the perfect formula of feminine beauty. I can’t find any reason anywhere for why he did this, but I like to think it suggests the perfection of his designs. 5) Dior always new that Women would make him money. At the age of 14 a fortuneteller told Dior that he would be involved a lot with women and they would make him a lot of money. How very true! 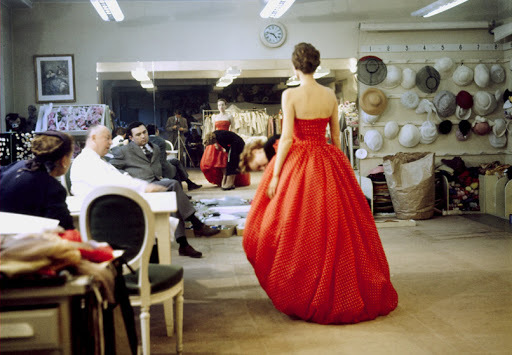 Dior was incredibly ambitious this is without doubt, but his aim had never been to be THE designer of a generation. Boussac, his backer, initially needed a designer to take over the failing couturier Philippe Gaston. At the time this was one of the big couture houses, always noted in Vogue, yet having fallen a little out of favour. 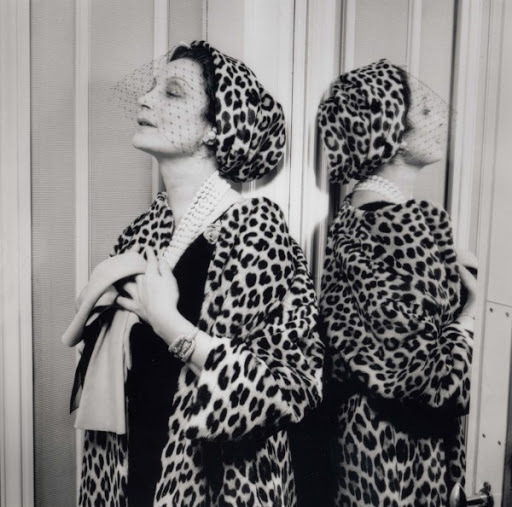 Boussac had Dior in mind to take over, but Dior did not want to work under another designers name and wanted Boussac to back him in his own couture house instead. Boussac was impressed by Dior’s driven attitude and agreed to back him. Dior had high hopes for a very successful yet small house. He had no inclination that his first collection would have the massive impact it did. He said at the time that he woke up the day after his first show “a famous man”. 7) Only 18 American journalists turned up to Dior’s first show. Dior was the final show of Paris fashion week, and many American journalists decided to go home early rather than go and see the new kid on the block. Those who had chosen to go home early soon regretted their mistake and many were made to turn back and return to Paris to go and see the collection after the show. 8) Dior created 5% of France’s GDP. Couture throughout the 20th century has been a huge part of France’s GDP but in the 50’s it really was integral. Couture at the time was 1/3 of France’s GDP and Dior created 5% of France’s GDP on his own, it now seems almost unfathomable that a single man could have bought so much wealth into a nation by himself, and this really is a credit to his design prowess.